Daniel Goodliffe was born 5 July 1805 at Lambley Lodge, Rutland. Daniel married Mary ATKIN in about 1830. They had a son (Edward) and a daughter before Mary died, according to Arnold Goodliffe's memoirs. Daniel remarried to Elizabeth Alice MELTON (a widow) on 11 May 1836 in the church at Barleythorpe. They bought a small farm (52 acres) in Barleythorpe. They had Daniel James in 1837, Martha in 1838 and Elizabeth Alice in 1846. 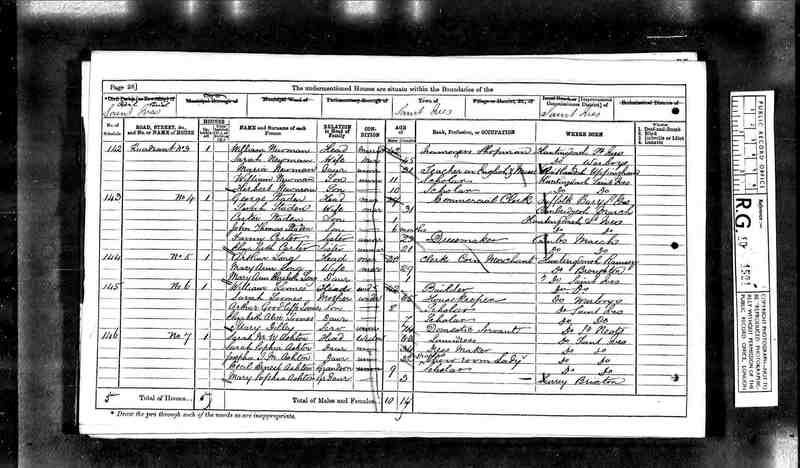 1841 Census: In 1841 Daniel and family are listed in Barleythorpe. 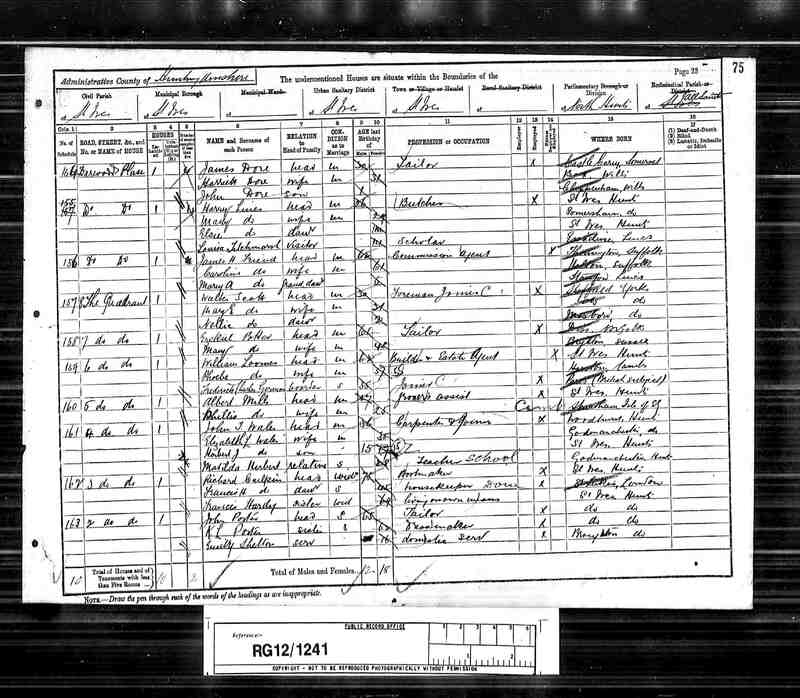 Elizabeth his new wife is not present, but his older daughter (Mary Ellen) was boarding with John and Elizabeth BARLOW in Church St, Oakham. Edward Thomas is not present either - I think he might have died by this date. By 1851 the family had moved into town to North Gate St, Oakham. According to Arnold Goodliffe's memoirs, Daniel lost all his cattle in two outbreaks of Foot & Mouth disease. 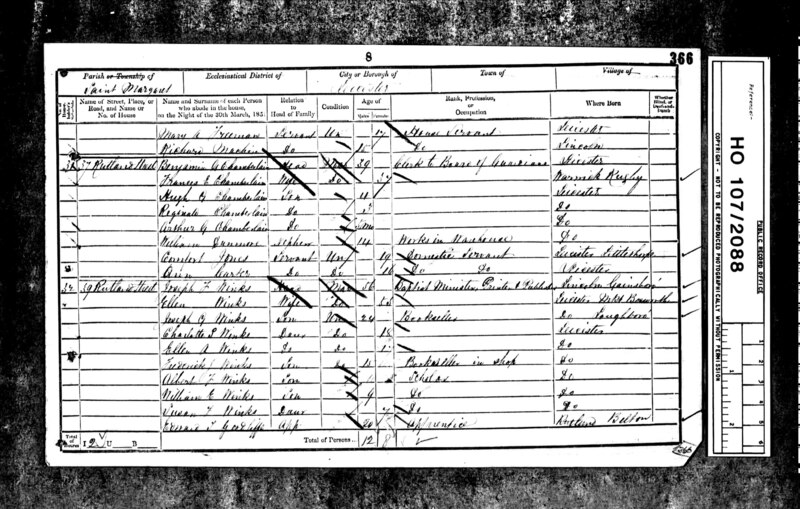 He lost confidence in farming and moved to Oakham as Deacon at the Baptist Church at Barrowden and Morcott, although in the 1851 census he is still listed as Occupier of 52 acres, and Elizabeth as a "grazier's wife". However they did live adjacent to John Jenkinson, Baptist Minister, so Arnold's story may well be correct. 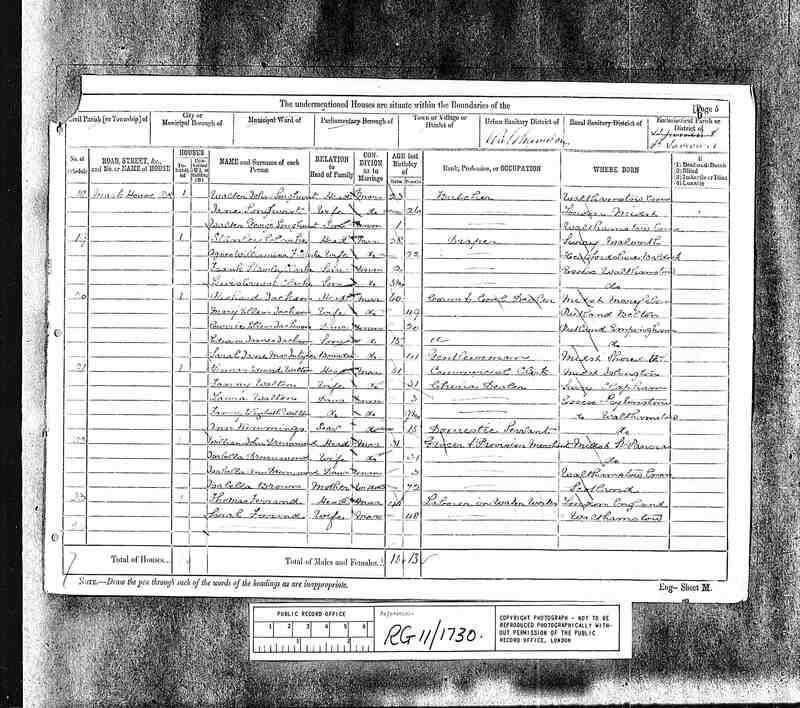 I cannot find Martha in the 1851 census. 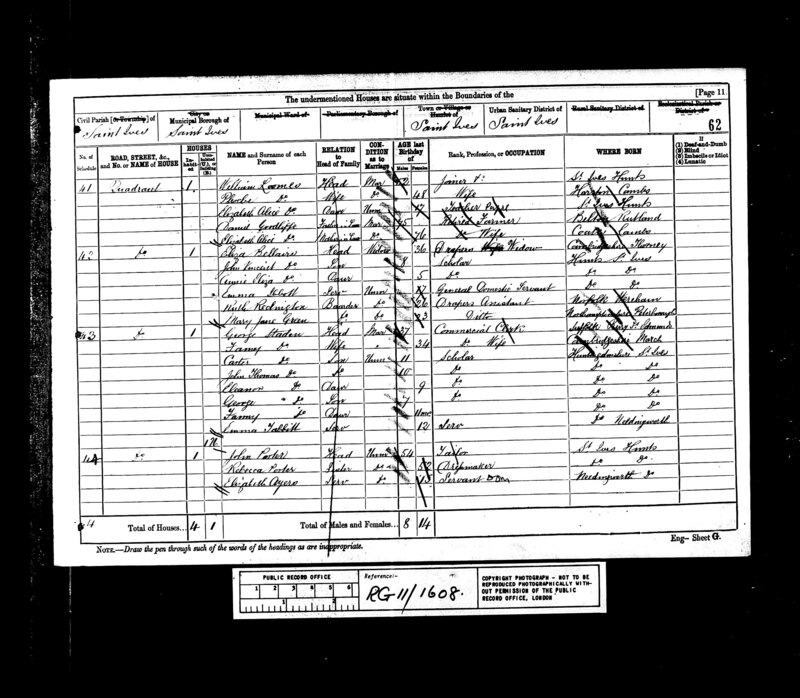 Edward Thomas Goodliffe: In the 1851 census, Daniel's son from his first wife, Edward Thomas was aged 20 and was boarding with the Baptist Minister (Joseph Winks) at 39 Rutland St, Leicester. His occupation was Apprentice. Edward does not appear in any further censuses - nor is he in the marriage or death indexes. He is not in the Immigration records for Victoria or New South Wales in Australia - so where is he? Marriage of Martha: In the Sep quarter 1861, their daughter Martha married William LOOMES at St Ives, Cambridgeshire (St Ives 3b/350). 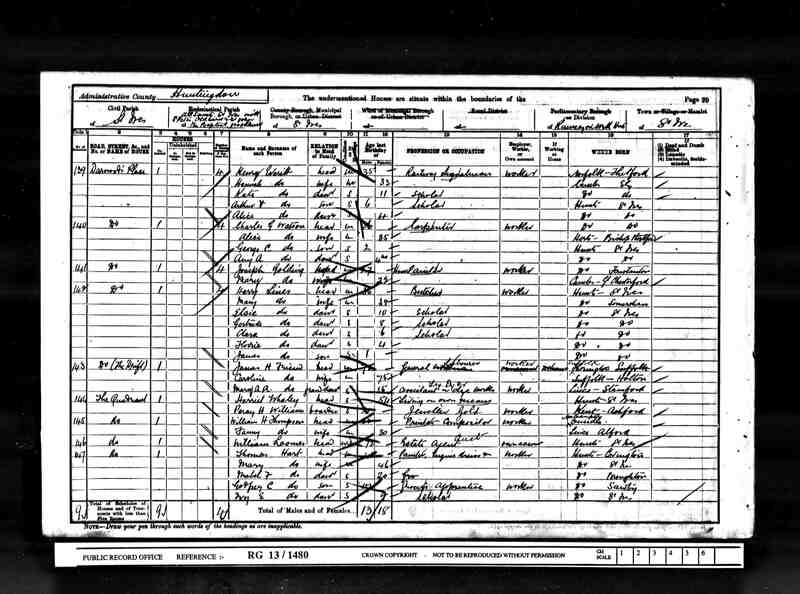 In the 1861 census, William (Looms) was unmarried, aged 32 and living with parents James (67) and Sarah (57) at the Cow and Hare Public House, St Ives. This pub was in Crown St, not far from Cromwell Place, and The Quadrant, where the Goodliffes later lived. 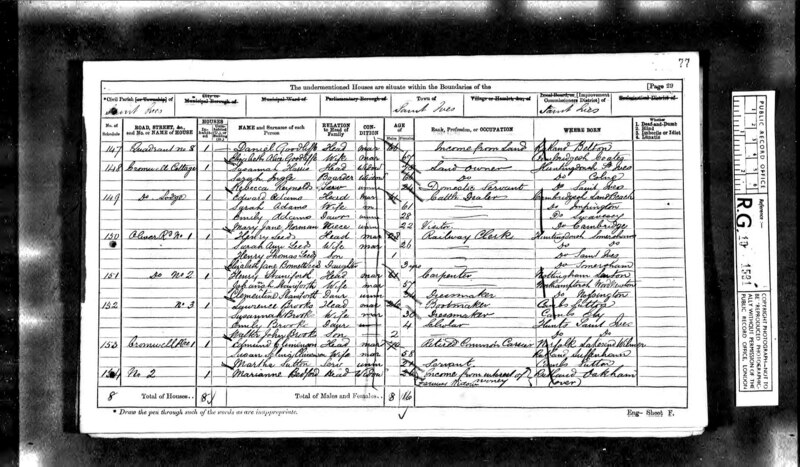 Martha and William had 3 children - Arthur Goodliffe LOOMES (born Sep qtr 1862 3b/259), Elizabeth Alice LOOMES (born Jun qtr 1863 at St Ives 3b/301) and Martha Goodliffe LOOMES (born and died Sep 1864). Martha (the elder) died in Jun 1864, suggesting she died in childbirth with Martha, in late June, with Martha's birth registered in June. "where for many years they resided near their excellent and loving daughter who married a distant relative – Mr. Loams. He was again left a widower after living more than 40 years with his last wife. In his little cottage he enjoyed himself visiting reading and comforting as far as he was able his poor and aged neighbours; he is now with his son-in-law and daughter Jackson, in the commencement of this year 1887 his 82nd year, cheerful and happy ready and waiting for the call to enter the many mansions." 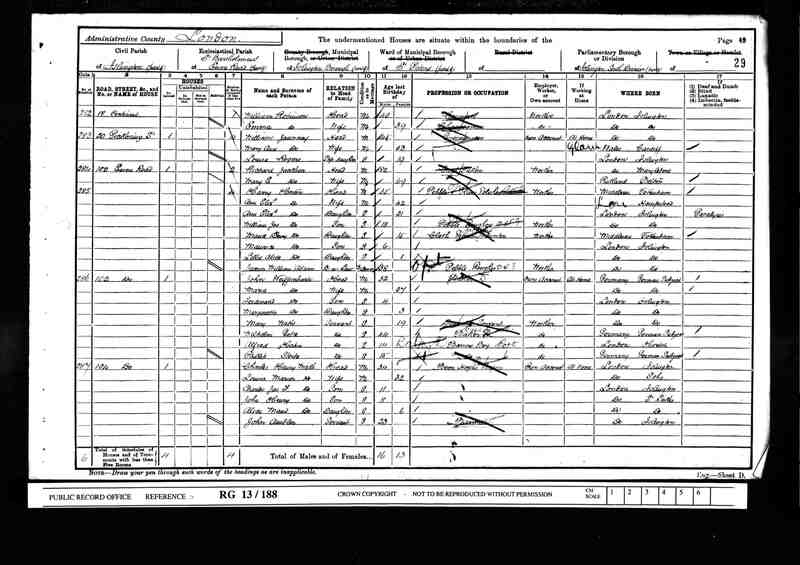 In the 1871 census Daniel and Elizabeth Alice are living at The Quadrant No 8, St Ives, where Daniel's occupation is "Income from Land". This suggests he may well have retained ownership of the 52 acres at Barleythorpe. Two doors away at Quadrant No 6 lived William Loomes (widow aged 42), his mother Sarah (65), Arthur Goodliffe Loomes (scholar 8) and Elizabeth Alice Loomes (scholar 7). 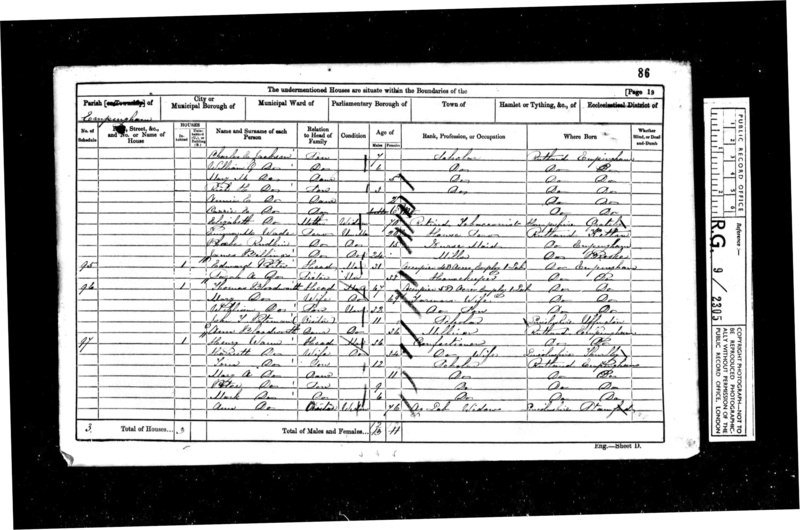 1881 Census: By 1881, Daniel and Elizabeth had moved in with their son-in-law, who by now had remarried, to Phoebe YOUNG (St Ives, March quarter 1879 3b/353). Elizabeth Alice Goodliffe died in St Ives in June qtr, 1884 (3b/162), aged 80. 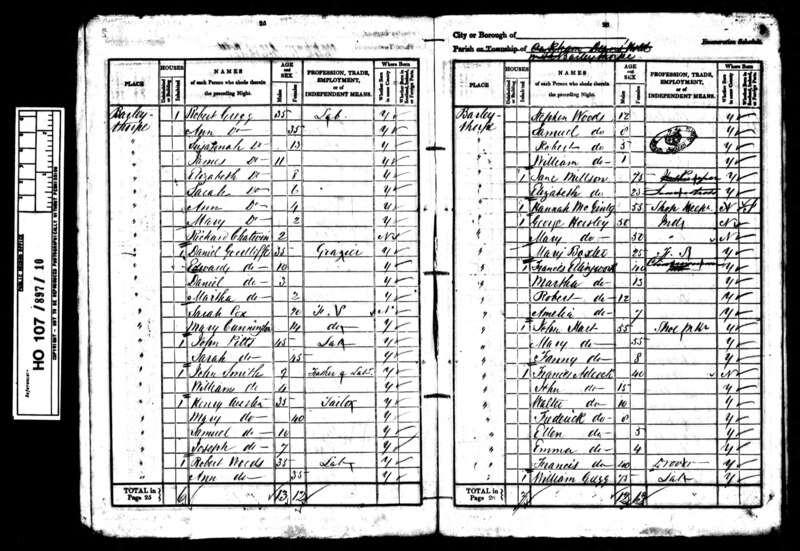 Daniel died prior to the 1891 census. (There is a death recorded for a Daniel Goodliffe, aged 84 in March quarter 1890, West Ham 4a/158. This may be him.) By 1891 William and Phoebe Loomes (indexed as Loomer in the 1891 and 1901 censuses) are living alone, still at 6 The Quadrant, St Ives. Phoebe died in the December quarter 1898 aged 68 at St Ives (3b/186). 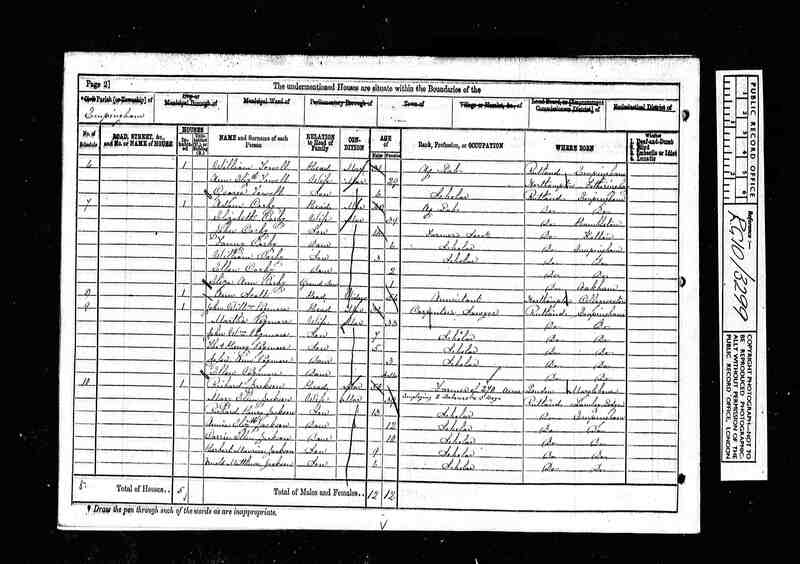 By 1901 William was living alone, a widow at the same address. He died Jun 1903 at St Ives (3b/164). Mary Ellen was born on 29 October 1831 at Lambley Lodge, Belton, Rutland. Her mother (Mary) died in about 1831. By 1841 she was at school in Oakham, boarding with John Barlow in Church St.
Mary Ellen married Richard JACKSON in Empingham on 30 June 1852. They had 9 children. 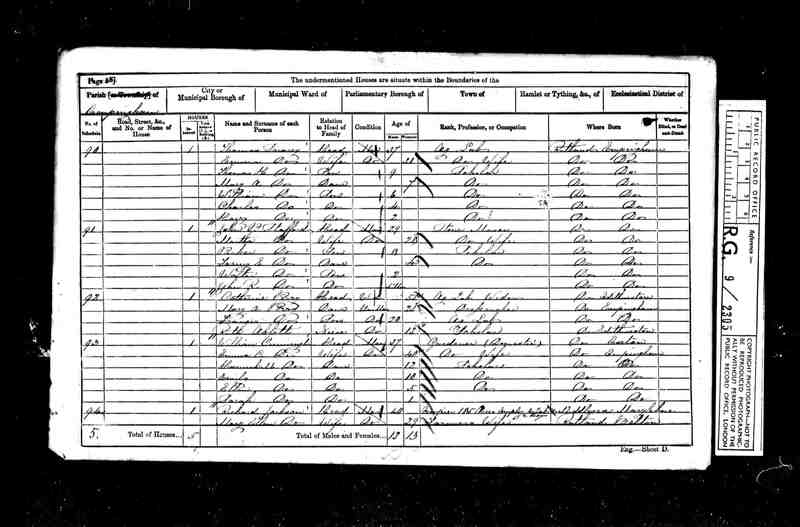 1871 Census: they are still in Empingham. 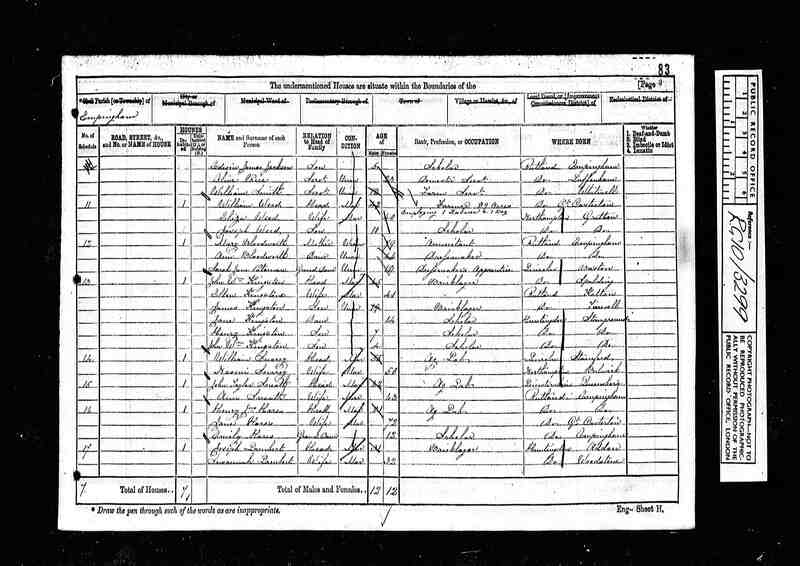 1881 Census: the family had moved to Mark House Road, Walthamstow, Essex, where Richard was now a Corn and Coal Dealer. 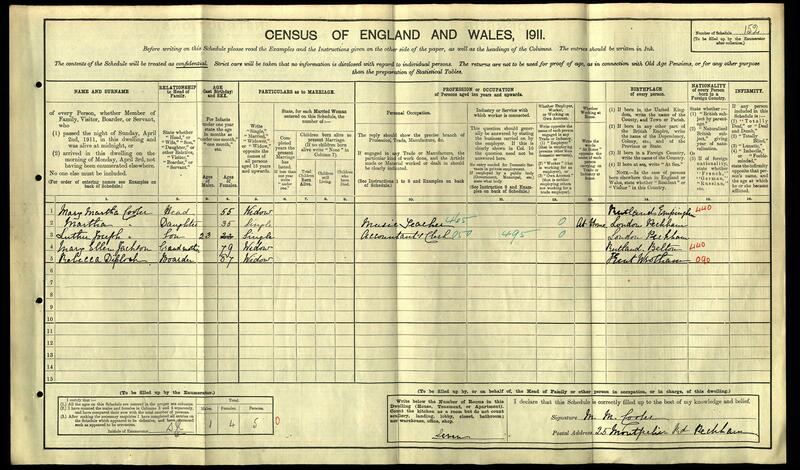 1901 Census: 100 Essex Rd, Islington, London. 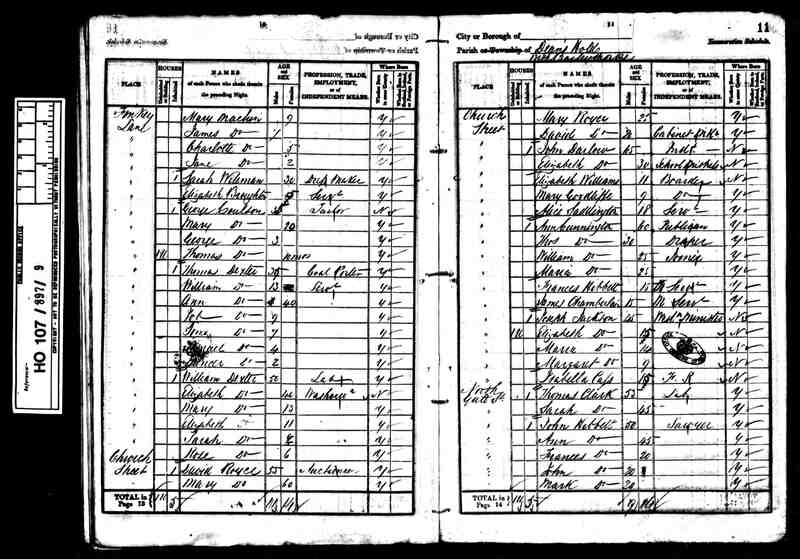 1911 census: Mary is now a widow aged 79 and living with her grand-daughter Mary Martha COOLER at 25 Montpelier Rd, Peckham. 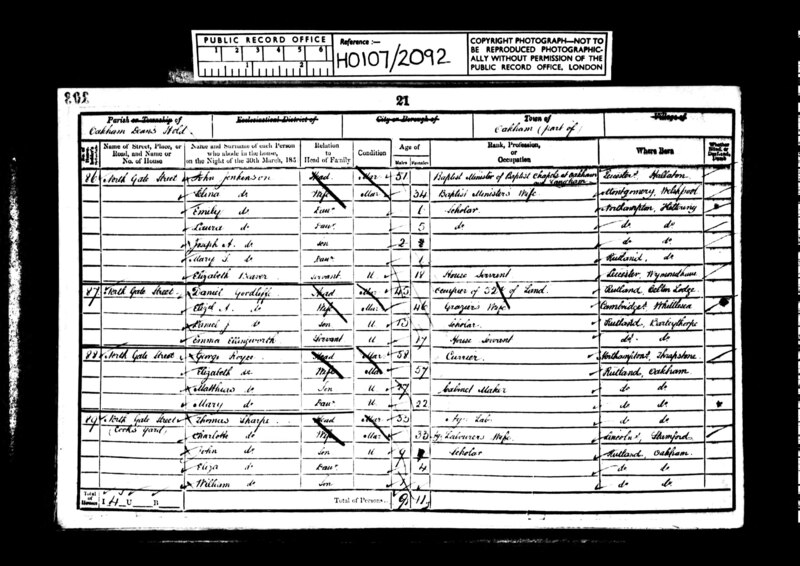 Mary Ellen died 14 February 1913 (I have not confirmed this date) also in Peckham North (Mar qtr camberwell 1d/1130).